According to Vedic astrology, Rahu is debilitated in a horoscope when it is placed in the sign of Scorpio, which in simple words means that Rahu becomes the weakest when placed in Scorpio compared to its placement in all the other signs. Debilitated Rahu is associated with many bad things by many astrologers and it is believed by a number of astrologers that debilitated Rahu always works negatively in a horoscope and it brings bad results for the native under its influence. This is not the case in actual practice and debilitated Rahu can work positively as well as negatively in a horoscope depending on the other deciding factors and depending on the overall tone of the horoscope of a native under consideration. The word debilitated simply relates to the strength of Rahu in a horoscope and it doesn’t relate to the nature of Rahu in a horoscope. Accordingly debilitated Rahu placed in different houses of a horoscope can give benefic as well as malefic results depending on the nature of Rahu as well as depending on the overall tone of the horoscope. We will now discuss some of these benefic as well as malefic effects which can be experienced when debilitated Rahu is placed in different houses of a horoscope. While discussing some of these effects, it should be noted that due to its debilitation, Rahu alone generally doesn’t provide strong positive or negative results and it needs to be supported by other positive or negative planets in order to produce such results. Hence we will discuss good or bad results given by debilitated Rahu in combination with other positive or negative planets in a horoscope. Debilitated Rahu in 1st House : When benefic in nature, debilitated Rahu placed in the first house of a horoscope can bless the native under its effect with good results related to marriage, profession, finances, fame, reputation, health, spiritual growth and many other types of good results. Accordingly the natives blessed by this benefic planet may experience good things happening in many spheres of their lives depending on the overall tone of their horoscopes. Benefic debilitated Rahu in the first house of a horoscope can especially prove good for the profession of the native and accordingly it can bless the native with success through a number of professional fields. Hence the natives under its effect may engage in a large number of professional spheres and they may achieve success through them, if their overall horoscopes are supportive. Some natives under the impact of such benefic debilitated Rahu may achieve posts of power and authority in the house of government through jobs or through politics depending on their overall horoscopes. Some of these natives may become police officers, some of these natives may become administrative officers, some other such natives may become army officers and some of these natives may achieve such authority as revenue officers. Yet some other natives benefitting from such benefic debilitated Rahu may engage in the field of law and they may get elevated to the posts of judges whereas some other natives of this type may become ministers in governments through politics. This placement of benefic debilitated Rahu in the first house of a horoscope is also very good at producing special people from the domains of mathematics, science, discoveries, explorations and many other such domains. Hence some natives under the effect of such benefic debilitated Rahu may become scientists, some of them may shine in the field of mathematics, some other such natives may become discoverers and some of these natives may explore new possibilities in many spheres of life. Benefic debilitated Rahu in the first house of a horoscope can also render special interests and abilities to some natives under its impact due to which some of these natives may become spiritual gurus, some of them may become yoga gurus, some of these natives may become tantrics and some other such natives may become astrologers. For example, if benefic debilitated Rahu is placed in the first house of a horoscope in the sign of Scorpio, benefic Ketu is placed in the seventh house of this horoscope in the sign of Taurus, benefic Saturn is placed in the eighth house of this horoscope in the sign of Gemini and benefic Mars is placed in the fourth house of this horoscope in the sign of Aquarius, the native may engage in the line of astrology. The native blessed by such benefic debilitated Rahu and other benefic planets may acquire good knowledge of astrology by virtue of his continuous study related to various aspects of astrology for many years of his life and he may start practicing as a professional astrologer after that. The combined effect of such benefic debilitated Rahu and other benefic planets may bless the native with good amount of money and success through the field of astrology and these results may improve if there are some other benefic influences in this horoscope. If benefic Sun is placed in the seventh house of this horoscope in the sign of Taurus along with benefic Ketu, benefic Mercury is placed in the sixth house of this horoscope in the sign of Aries and benefic Venus is placed in the eighth house of this horoscope in the sign of Gemini along with benefic Saturn when benefic debilitated Rahu and other benefic planets are placed in the already mentioned houses of this horoscope, the results may improve a lot. The native blessed by such benefic debilitated Rahu and other benefic planets may possess very good knowledge of astrology and he may earn very good amount of money, success, fame and recognition as an astrologer. The combined effect of such benefic debilitated Rahu and other benefic planets may also bless the native with his appearance in some TV shows based on the theme of astrology and the native may achieve fame through such TV shows. The addition of more benefic planets to this horoscope may add more strength to this equation and accordingly the native blessed by such benefic debilitated Rahu and other benefic planets may witness even better results through the field of astrology. Some other natives under the effect of benefic debilitated Rahu in the first house of their horoscopes may bend towards a field of profession like medical science and they may become professional doctors. For example, if benefic debilitated Rahu is placed in the first house of a horoscope in the sign of Scorpio, benefic Ketu is placed in the seventh house of this horoscope in the sign of Taurus, benefic Venus is placed in the sixth house of this horoscope in the sign of Aries and benefic Moon is placed in the eighth house of this horoscope in the sign of Gemini, the native may become a doctor. The native blessed by such benefic debilitated Rahu and other benefic planets may pursue the course of his higher studies in some subject related to medical science and he may start practicing as a doctor after that. The combined effect of such benefic debilitated Rahu and other benefic planets may bless the native with a well paying job in a medical institute and the native may earn good amount of money and success as a doctor. However if benefic Sun is placed in the seventh house of this horoscope in the sign of Taurus along with benefic Ketu; and benefic Mars is placed in the fifth house of this horoscope in the sign of Pisces when benefic debilitated Rahu and other benefic planets are placed in the already mentioned houses of this horoscope, the equation may become much more productive. The native blessed by such benefic debilitated Rahu and other benefic planets may engage in independent practice as a doctor and he may earn very good amount of money, success and recognition as doctor. The combined effect of such benefic debilitated Rahu and other benefic planets may bless the native with very good knowledge of his field and the native may have a very good success rate as a doctor. As more benefic planets add to this horoscope, the native blessed by such benefic debilitated Rahu and other benefic planets may come across even better results through this field of profession. For example, the presence of benefic Mercury in the seventh house of this horoscope in the sign of Taurus along with benefic Sun and Ketu can render even more success to the native through the field of medical science. Apart from profession, benefic debilitated Rahu placed in the first house of a horoscope can give good results related to marriage of the native under its effect and it can also bless the native with many other good things related to many other spheres of his life. On the other hand, malefic debilitated Rahu in the first house of a horoscope can trouble the native with problems related to marriage, profession, finances, health and many other types of problems. As a result, the natives under the effect of this malefic planet may come across some of these bad results depending on the overall tone of their horoscopes. Malefic debilitated Rahu in the first house of a horoscope can especially prove bad for the profession of the native due to which the natives under its impact may have to face many types of problems related to their professions. Such problems may intensify if there are some other malefic influences in one such horoscope as the native in this case may have to remain jobless for many years of his life or he may have to face big financial losses through a business. In extreme cases when supported by other malefic planets, malefic debilitated Rahu in the first house of a horoscope can keep the native jobless for a continuous period of more than two years, more than once in his life or it can make him suffer from the complete loss of a business capital on account of serious financial losses. When working positively, debilitated Rahu placed in the second house of a horoscope can bless the native under its influence with good results related to profession, finances, marriage, health, authority and many other types of good results. Accordingly the natives under the effect of this benefic placement may witness some of these good results depending on the overall tone of their horoscopes. The presence of benefic debilitated Rahu in the second house of a horoscope can especially prove good for the financial and professional aspect of the native due to which the natives under its impact may engage in a wide variety of professional fields and they may achieve success through them, if their overall horoscopes are supportive. Benefic debilitated Rahu in the second house of a horoscope can make some natives interested in professions related to the field of science and hence some of these natives may become scientists, some other such natives may become doctors, some of these natives may become engineers and yet some other natives may engage in the field of teaching where the subject they teach may be a subject of science or mathematics. When benefic in nature, debilitated Rahu placed in the second house of a horoscope can also bless some natives under its effect with posts of power and authority in the house of government through jobs or through politics. Hence some natives under its impact may become police officers, some of these natives may become army officers, some other such natives may become administrative officers and yet some other natives may achieve such authority as revenue officers. For example, if benefic debilitated Rahu is placed in the second house of a horoscope in the sign of Scorpio, benefic Ketu is placed in the eighth house of this horoscope in the sign of Taurus, benefic Saturn is placed in the ninth house of this horoscope in the sign of Gemini and benefic Mercury is placed in the fourth house of this horoscope in the sign of Capricorn, the native may engage in the field of revenue services. The native blessed by such benefic debilitated Saturn and other benefic planets mentioned in this example may get selected for a post of authority in revenue services and he may earn good amount of money, success and recognition through this field of profession. If in the same horoscope, benefic Mars is placed in the second house in the sign of Scorpio along with benefic debilitated Rahu, benefic Jupiter is placed in the eighth house in the sign of Taurus along with benefic Ketu; and benefic Venus is placed in the fourth house in the sign of Capricorn along with benefic Mercury, the equation may become much more favorable. This is due to the fact that the presence of benefic Jupiter and benefic Venus in the eighth and fourth house of this horoscope may add more positive energy to this horoscope and the presence of benefic Mars in the second house of this horoscope in the sign of Scorpio along with benefic debilitated Rahu may form Neechbhang Rajyoga in the horoscope. 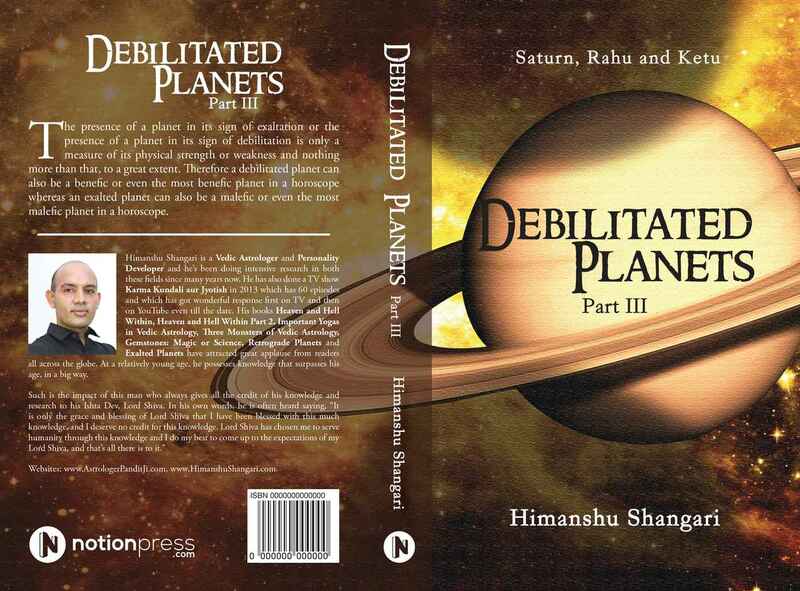 According to its definition, if a benefic debilitated planet is joined by a benefic planet, which is either the lord of its sign of debilitation or which gets exalted in its sign of debilitation, the debilitation status of this planet may get cancelled and Neechbhang Rajyoga may be formed in the horoscope, which may bless the native with very good results through some spheres of his life, depending on the overall tone of his horoscope. In the case under consideration, benefic Mars being the planetary lord of the sign Scorpio may cancel the debilitation status of benefic Rahu and these two planets may form Neechbhang Rajyoga in the second house of this horoscope, which may bless the native with high authority through a service related to revenue, as indicated by the overall horoscope of this native. Therefore, the native blessed by such benefic debilitated Rahu and other benefic planets may achieve success in some competitive exams held for selection in revenue services and by virtue of such success, he may get selected for the highest possible direct rank in revenue services. The benefic effect of debilitated Rahu in the second house combined with the benefic effect of all other benefic planets mentioned in this example may bless the native with a very good career in this field of profession and the native may earn very good amount of money, success and recognition as a revenue officer. If benefic Moon is placed in the eleventh house of this horoscope in the sign of Leo or benefic Sun is placed in the third house of this horoscope in the sign of Sagittarius when benefic debilitated Rahu and other benefic planets are placed in the already mentioned houses of this horoscope, the native may achieve even better results as a revenue officer. Benefic debilitated Rahu in the second house of a horoscope can also make some natives interested in the field of politics and these natives may achieve success through this field, if their overall horoscopes are supportive. For example, if benefic debilitated Rahu is placed in the second house of a horoscope in the sign of Scorpio, benefic Ketu is placed in the eighth house of this horoscope in the sign of Taurus, benefic exalted Saturn is placed in the first house of this horoscope in the sign of Libra and benefic Venus is placed in the fifth house of this horoscope in the sign of Aquarius, the native may join politics. The native under the combined effect of such benefic debilitated Rahu and other benefic planets may actively engage in the field of politics and he may witness good amount of success through this field, particularly after his age of 35. The native blessed by such benefic debilitated Rahu and other benefic planets may witness good growth through the field of politics with his passing age and he may get a chance to contest in a public election on behalf of a well established political party, after his age of 35. At the same time, if benefic Sun is placed in the sixth house of this horoscope in the sign of Pisces, benefic Mercury is placed in the fifth house of this horoscope in the sign of Aquarius along with benefic Venus; and benefic exalted Jupiter is placed in the tenth house of this horoscope in the sign of Cancer when benefic debilitated Rahu and all other benefic planets are placed in the already mentioned houses of this horoscope, the results may become very good. The native under the combined effect of such benefic debilitated Rahu and other benefic planets may win public elections more than once in his life, he may represent a region of his state in the assembly of that state and he may become a minister in a state government more than once in his life. As more benefic planets add to this horoscope, the native blessed by such benefic debilitated Rahu and other benefic planets may achieve even more success as a politician. For example, the presence of benefic Mars in the second house of this horoscope in the sign of Scorpio along with benefic debilitated Rahu or the presence of benefic Moon in the tenth house of this horoscope in the sign of Cancer along with benefic exalted Jupiter can add even more positive energy to this equation. As a result, the native under the combined effect of such benefic debilitated Rahu and other benefic planets may become a leader of national fame, he may win more than one national election and he may become minister in the national government, more than once in his life. Apart from profession, benefic debilitated Rahu in the second house of a horoscope can bless the native with good results related to his marriage and it can also give good results related to some other spheres of his life. On the other hand, malefic debilitated Rahu in the second house of a horoscope can trouble the native with problems related to marriage, profession, finances, health and many other types of problems. Accordingly the natives under the malefic effect of this placement may have to suffer from some of these problems depending on the overall tone of their horoscopes. Some natives under the effect of such malefic debilitated Rahu may feel the heat of this placement in the sphere of their health and they may have to suffer from a variety of health problems and diseases, depending on the overall tone of their horoscopes. For example, if malefic debilitated Rahu is placed in the second house of a horoscope in the sign of Scorpio, malefic Ketu is placed in the eighth house of this horoscope in the sign of Taurus, malefic Saturn is placed in the twelfth house of this horoscope in the sign of Virgo and malefic Venus is placed in the third house of this horoscope in the sign of Sagittarius, the native may become a drug addict. The native under the combined effect of such malefic debilitated Rahu and other malefic planets may get addicted to a harmful drug and he may consume it on regular basis due to which he may have to suffer from health problems and diseases, apart from suffering on other fronts of his life. At the same time, if malefic Mars is placed in the second house of this horoscope in the sign of Scorpio along with malefic debilitated Rahu; and malefic Jupiter is placed in the third house of this horoscope in the sign of Sagittarius along with malefic Venus, the equation may become much more destructive. The native troubled by such malefic debilitated Rahu and other malefic planets may die at a young age due to drug overdose or due to some fatal disease inflicted upon him by such harmful drug. According to Vedic astrology, Saturn is debilitated in a horoscope when it is placed in the sign of Aries, which in simple words means that Saturn becomes the weakest when placed in Aries compared to its placement in all the other signs. Debilitated Saturn is associated with many bad things by many astrologers and it is believed by a number of astrologers that debilitated Saturn always works negatively in a horoscope and it brings bad results for the native under its influence. This is not the case in actual practice and debilitated Saturn can work positively as well as negatively in a horoscope depending on the other deciding factors and depending on the overall tone of the horoscope of a native under consideration. The word debilitated simply relates to the strength of Saturn in a horoscope and it doesn’t relate to the nature of Saturn in a horoscope. Accordingly debilitated Saturn placed in different houses of a horoscope can give benefic as well as malefic results depending on the nature of Saturn as well as depending on the overall tone of the horoscope. We will now discuss some of these benefic as well as malefic effects which can be experienced when debilitated Saturn is placed in different houses of a horoscope. While discussing some of these effects, it should be noted that due to its debilitation, Saturn alone generally doesn’t provide strong positive or negative results and it needs to be supported by other positive or negative planets in order to produce such results. Hence we will discuss good or bad results given by debilitated Saturn in combination with other positive or negative planets in a horoscope. Debilitated Saturn in 1st House : When benefic in nature, debilitated Saturn placed in the first house of a horoscope can bless the native with good results related to profession, finances, fame, marriage, health and many other types of good results. Accordingly the natives under the effect of this benefic planet may witness some of these good results depending on the overall tone of their horoscopes. Benefic debilitated Saturn in the first house of a horoscope can especially prove good for the profession of the native and it can bless him with success through many fields of professions. Hence the natives under its impact may engage in different professions and they may achieve different amount of success through them, as allowed by their overall horoscopes. Benefic debilitated Saturn in the first house of a horoscope can bless some natives under its influence with posts of power and authority in the house of government through jobs or through politics. Accordingly some of these natives may become police officers, some of them may become army officers, some of them may become revenue officers and some of them may achieve such authority through some other jobs, depending on their horoscopes. For example, if benefic debilitated Saturn is placed in the first house of a horoscope in the sign of Aries, benefic exalted Mars is placed in the tenth house of this horoscope in the sign of Capricorn and a benefic combination of Sun and Mercury is placed in the eighth house of this horoscope in the sign of Scorpio, the native may join police force. The native under the combined effect of such benefic debilitated Saturn and other benefic planets may get selected for a post of authority in the police force and he may achieve success and recognition as a police officer. At the same time, if benefic Moon is placed in the fifth house of this horoscope in the sign of Leo, benefic Rahu is placed in the first house of this horoscope in the sign of Aries along with benefic debilitated Saturn; and benefic Ketu is placed in the seventh house of a horoscope in the sign of Libra when all other planets are placed in the already mentioned houses, the equation may improve a lot. The native blessed by such benefic debilitated Saturn and other benefic planets may succeed in some competitive exams for selection in the police force and by virtue of such success, he may get selected for the highest possible direct rank in the police force. The combined effect of such benefic debilitated Saturn and other benefic planets may bless the native with very good amount of success and recognition through this field of profession and the native may have a very good career as a police officer. As more benefic influences add to this horoscope, the native blessed by all such benefic influences may benefit even more. For example, if benefic Jupiter is placed in the ninth house of this horoscope in the sign of Sagittarius or if benefic Venus is placed in the eighth house of this horoscope in the sign of Scorpio along with benefic Sun and Mercury when benefic debilitated Saturn and other benefic planets are placed in the already mentioned houses, the native may achieve even better results. The native under the combined effect of such benefic debilitated Saturn and other benefic planets may get deputed to some of the most prestigious crime investigating agencies of his country in case benefic Jupiter is placed in the ninth house of this horoscope. The presence of benefic Venus in the eighth house may bless the native with even better crime solving abilities and hence the native under the effect of such benefic debilitated Saturn and other benefic planets may become one of the most successful police officers of his batch. Considering one more example, if benefic debilitated Saturn is placed in the first house of a horoscope in the sign of Aries, benefic exalted Mars is placed in the tenth house of this horoscope in the sign of Capricorn, benefic Sun is placed in the fifth house of this horoscope in the sign of Leo and benefic Mercury is placed in the sixth house of this horoscope in the sign of Virgo, the native may become a revenue officer. The native under the combined effect of such benefic debilitated Saturn and other benefic planets may get selected for a post of authority in the revenue services and he may achieve good amount of success and recognition through this field of profession. At the same time, if benefic Moon is placed in the tenth house of this horoscope in the sign of Capricorn along with benefic exalted Mars, benefic Rahu is placed in the eighth house of this horoscope in the sign of Scorpio and benefic Ketu is placed in the second house of this horoscope in the sign of Taurus when benefic debilitated Saturn and other planets are placed in the already mentioned houses, the results may improve. The native blessed by such benefic debilitated Saturn and other benefic planets may get selected for highest possible direct rank in the revenue services by virtue of being successful in some competitive exams held for selection in revenue services. The combined effect of such benefic debilitated Saturn and other benefic planets can bless the native with very good amount of success and recognition through this field of profession and the native may accomplish some very good things during his career as a revenue officer. As more benefic planets add to this horoscope, the native blessed by such benefic debilitated Saturn and other benefic planets may achieve even more success through this field of profession. For example, the presence of benefic Venus in the fifth house of this horoscope in the sign of Leo along with benefic Sun or the presence of benefic Jupiter in the first house of this horoscope in the sign of Aries along with benefic debilitated Saturn may bless the native with even better results. The native under the combined effect of such benefic debilitated Saturn and other benefic planets may have an extraordinary career as a revenue officer and he may serve at the top of his department before his retirement. On the other hand, malefic debilitated Saturn in the first house of a horoscope can trouble the native with problems related to profession, finances, marriage, health and many other types of problems. Accordingly the natives under its effect may have to suffer from some of these problems depending on their overall horoscopes. Malefic debilitated Saturn in the first house of a horoscope can especially prove bad for the profession of the native and it can create many types of problems in his profession. Some natives under the effect of this malefic planet may not establish in a profession till late in their lives and they may have to struggle a lot in order to find a permanent and fruitful profession. Some other natives suffering from such malefic debilitated Saturn may have to suffer from many failed businesses during their lifetimes and they may not be able to witness a successful business till their age of 41. Malefic debilitated Saturn in the first house of a horoscope can also cause setbacks and losses through the profession of the native and these losses may become serious if there are other malefic influences in the horoscopes of these natives. In extreme cases when supported by other malefic planets in a horoscope, malefic debilitated Saturn in the first house can make the native suffer from the complete loss of a business capital by virtue of some serious loss or setback, more than once in his life. Such malefic influence in a horoscope can also trouble the overall financial equation of the native under its influence due to which some natives under its effect may have poor financial equations, primarily due to their failure to earn money from their professions. If such malefic debilitated Saturn is supported by some other malefic influences in a horoscope and the overall tone of the horoscope is also negative, it can make the native spend his entire life in poverty. Malefic debilitated Saturn in the first house of a horoscope can also affect the overall lifespan of the native in a negative way due to which the natives under its impact may have shorter or much shorter lifespan, depending on the rest of their horoscopes. When working positively, debilitated Saturn placed in the second house of a horoscope can bless the native with good results related to profession, finances, wealth, marriage, health and many other types of good results. Accordingly the natives under the effect of this benefic influence may experience some of these good results depending on the overall tone of their horoscopes. Benefic debilitated Saturn in the second house of a horoscope can especially prove good for the professional and financial aspect of the native. Hence the natives under its impact can engage in a variety of professions and they may achieve the amount of success through such professions, as allowed by their overall horoscopes. Some natives benefitting from benefic debilitated Saturn in the second house may engage in various types of professions related to the field of finance whereas some of them may achieve posts of power and authority in the house of government as police officers, administrative officers, revenue officers, judges and as other officers. Benefic debilitated Saturn in the second house can also render special abilities to some natives under its influence due to which these natives may engage in the fields like spiritualism, astrology, tantra and other such fields. Some other such natives may go abroad on the basis of their professions and they may settle there permanently if their overall horoscopes are supportive. For example, if benefic debilitated Saturn is placed in the second house of a horoscope in the sign of Aries, benefic Jupiter is placed in the ninth house of this horoscope in the sign of Scorpio, benefic Rahu is placed in the first house of this horoscope in the sign of Pisces and Ketu is placed in the seventh house of this horoscope in the sign of Virgo, the native may go abroad. The native blessed by such benefic debilitated Saturn and other benefic planets may go abroad on the basis of his profession and he may settle there permanently, if there are no opposing influences in his horoscope. The combined effect of such benefic debilitated Saturn and other benefic planets can bless the native with good results through his profession in a foreign country and the native may earn good amount of money and success. At the same time, if benefic Mars is placed in the second house of this horoscope in the sign of Aries along with benefic debilitated Saturn, benefic Moon is placed in the eighth house of this horoscope in the sign of Libra and benefic exalted Mercury is placed in the seventh house of this horoscope in the sign of Virgo, the equation may become much more productive. The native blessed by such benefic debilitated Saturn and other benefic planets may get an offer for a very well paying job form a foreign company based in a foreign country, he may go to such foreign country on the basis of his profession and he may settle there permanently. The combined effect of such benefic debilitated Saturn and other benefic planets can bend the native towards the field of financial analysis or scientific analysis and hence the native may go abroad under one of these job profiles. The native may earn very good amount of success, money and recognition through his profession and he may also accumulate very good amount of wealth in a foreign country. This is due to the fact that the presence of the benefic combination of debilitated Saturn and Mars in the second house of this horoscope may form Neechbhang Rajyoga. According to its definition, if a benefic debilitated planet is joined by a benefic planet which is either the lord of its sign of debilitation or which gets exalted in its sign of debilitation, the debilitation status of this planet may get cancelled and Neechbhang Rajyoga may be formed in the horoscope which may bless the native with very good results in some spheres of his life. In the present case, benefic Mars being the lord of the sign Aries may cancel the debilitation status of benefic Saturn and these two planets can form Neechbhang Rajyoga in the second house of this horoscope in the sign of Aries which may bless the native with very good results related to foreign settlement. Hence the native under the combined effect of such benefic debilitated Saturn and other benefic planets may experience very good results through his settlement in a foreign country. As more benefic influences add to this horoscope, the native blessed by such benefic debilitated Saturn and other benefic planets may profit even more through his settlement in a foreign country. Benefic debilitated Saturn in the second house of a horoscope can also render creative abilities to some natives under its influence due to which these natives may engage in the fields of profession where such creative abilities are valued. Such natives may become actors, singers, writers, musicians, dancers, designers, poets, painters and many other types of professionals depending on the overall tone of their horoscopes. For example, if benefic debilitated Saturn is placed in the second house of a horoscope in the sign of Aries, benefic Mercury is placed in the eleventh house of this horoscope in the sign of Capricorn, benefic Mars is placed in the tenth house of this horoscope in the sign of Sagittarius and benefic exalted Jupiter is placed in the fifth house of this horoscope in the sign of Cancer, the native may become a singer. The native under the combined effect of such benefic debilitated Saturn and other benefic planets may get blessed with good talent in the field of singing and he may engage in this field on professional basis. The blessings of such benefic debilitated Saturn and other benefic planets may render good amount of success, money and fame to the native, through the field of singing. At the same time, if benefic Venus is placed in the second house of this horoscope in the sign of Aries along with benefic debilitated Saturn, benefic exalted Moon is placed in the third house of this horoscope in the sign of Taurus, benefic Rahu is placed in the first house of this horoscope in the sign of Pisces and benefic Ketu is placed in the seventh house of this horoscope in the sign of Virgo, the results may improve a lot. The native blessed by such benefic debilitated Saturn and other benefic planets may have very good singing talent and he may earn very good amount of money, fame and recognition as a singer. The combined effect of such benefic debilitated Saturn and other benefic planets can make the native very famous as a singer and the native may also receive formal recognition for his singing talent. It means that the native may receive formal awards for his performance in some of his songs and he may come across many other types of benefits also. As more benefic influences add to this horoscope, the native blessed by such benefic debilitated Saturn and other benefic planets may experience even better results through the field of singing. Apart from profession, benefic debilitated Saturn in the second house of a horoscope can bless the native with good results through marriage and it can also render many other types of benefits to the native. On the other hand, malefic debilitated Saturn in the second house of a horoscope can cause problems related to marriage, profession, finances, health, lifespan and many other types of problems. Hence the natives under the effect of this malefic planet may have to suffer from some of these problems depending on the overall tone of their horoscopes. Such malefic debilitated Saturn can especially proved bad for the professional and financial aspect of the native due to which some natives under its influence may not find well paying jobs and they may have to engage in low paying jobs despite being qualified for well paying jobs. Some of these natives may not even find jobs relevant to their education or those relevant to their abilities and they may have to engage in jobs which may be different or entirely different from their fields of specialization. Malefic debilitated Saturn in the second house of a horoscope can also trouble the natives under its effect with losses and setbacks through their fields of profession due to which some natives under its impact may have to face financial losses through their professions. Such losses may intensify if such malefic debilitated Saturn is supported by some other malefic planets in a horoscope in which case the native may have to face serious financial losses through his field of profession, more than once in his life. In extreme cases when supported by other malefic planets, malefic debilitated Saturn in the second house of a horoscope can trouble the native with the complete loss of a business through financial losses and it can also make the native turn bankrupt. The placement of malefic debilitated Saturn in the second house of a horoscope can also cause problems in the marriage of the native due to which the natives under its effect may face a variety of problems related to their marriages, depending on the overall tone of their horoscopes. Such malefic debilitated Saturn generally doesn’t delay the marriage of the native on its own but it can trouble the native with serious problems after such marriage has happened. In extreme cases when supported by other malefic influences in a horoscope, malefic debilitated Saturn placed in the second house of a horoscope can break more than one marriage of the native due to various reasons, depending on the overall tone of his horoscope. According to Vedic astrology, Sun is debilitated in a horoscope when it is placed in the sign of Libra, which in simple words means that Sun becomes the weakest when placed in Libra compared to its placement in all the other signs. Debilitated Sun is associated with many bad things by many astrologers and it is believed by a number of astrologers that debilitated Sun always works negatively in a horoscope and it brings bad results for the native under its influence. This is not the case in actual practice and debilitated Sun can work positively as well as negatively in a horoscope depending on the other deciding factors and depending on the overall tone of the horoscope of a native under consideration. The word debilitated simply relates to the strength of the Sun in a horoscope and it doesn’t relate to the nature of the Sun in a horoscope. Accordingly debilitated Sun placed in different houses of a horoscope can give benefic as well as malefic results depending on the nature of the Sun as well as depending on the overall tone of the horoscope. We will now discuss some of these benefic as well as malefic effects which can be experienced when debilitated Sun is placed in different houses of a horoscope. While discussing some of these effects, it should be noted that due to its debilitation, Sun alone generally doesn’t provide strong positive or negative results and it needs to be supported by other positive or negative planets in order to produce such results. Hence we will discuss good or bad results given by debilitated Sun in combination with other positive or negative planets in a horoscope. Debilitated Sun in 1st House : When benefic in nature, debilitated Sun placed in the first house of a horoscope can bless the native under its influence with good results related to marriage, profession, finances, reputation and many other types of good results. Accordingly the natives under the effect of this benefic influence may come across some of these good results depending on the overall tone of their horoscopes. Some natives under the effect of such benefic influence may profit through their marriages in many possible ways and such profits can increase if such benefic debilitated Sun is joined by benefic Mercury in the first house of a horoscope. The placement of a benefic combination of debilitated Sun and Mercury in the first house of a horoscope can especially prove very good for female natives and it can bless them with good results through their marriages. For example, if benefic debilitated Sun is placed in the first house of a horoscope along with benefic Mercury in the sign of Libra, the female native under the effect of these planets may get married to a rich and influential person. At the same time, if benefic Mars is placed in the second house of this horoscope in the sign of Scorpio and benefic Saturn is placed in the twelfth house of this horoscope in the sign of Virgo along with debilitated Venus, the equation may become much more interesting. The female native under the combined effect of such benefic debilitated Sun and all other benefic planets may not enjoy many materialistic pleasures before her marriage. It means that such female native may be born in an average family and her parents may not be rich. Such female native may lead an average life before her marriage and she may not enjoy the pleasures which money and resources can provide. However the effect of such benefic debilitated Sun and all other benefic planets mentioned in this example may bless this female native with a rich and well established husband and she may witness a very good rise in her financial and social status after her marriage. At the same time, if benefic exalted Jupiter is placed in the tenth house of this horoscope in the sign of Cancer along with benefic Moon when benefic debilitated Sun and all other planets are placed in the already mentioned houses of this horoscope, the results may improve a lot. The female native blessed by all these benefic planets may get married to a man who may not only be rich, but who may also be a very well connected and resourceful person. It means the husband of such female native may be a well established businessman and he may also have a big network of powerful and resourceful people. The combined effect of such benefic debilitated Sun, exalted Jupiter and all other benefic planets can also bless this female native with many pleasures through her marriage and she may also join the business of her husband. As more benefic planets add to this horoscope, the female native under the combined effect of these benefic planets may witness even better results through her marriage. Considering one more such example, if a benefic combination of debilitated Sun, Venus and Mercury is placed in the first house of a horoscope in the sign of Libra, benefic Jupiter is placed in the twelfth house in the sign of Virgo and benefic Mars is placed in the ninth house of this horoscope in the sign of Gemini, the native may go abroad. The native under the combined effect of these benefic planets may get married to a girl who may be a foreign citizen and he may settle in such foreign country on the basis of his marriage, if his overall horoscope is supportive. For instance, if benefic exalted Rahu is placed in the eighth house of this horoscope in the sign of Taurus and exalted Ketu is placed in the second house of this horoscope in the sign of Scorpio when benefic debilitated Sun and all other planets are placed in the already mentioned houses of this horoscope, the results may become more favorable. The native blessed by all these benefic planets may get the citizen status of a foreign country on the basis of his marriage to a girl from foreign origin and he may settle in such foreign country on permanent basis. The combined effect of such benefic debilitated Sun and all other benefic planets can also bless the native with good amount of professional success in a foreign country, apart from making him a citizen of a foreign country on the basis of his marriage. The presence of benefic Moon in the eleventh house of this horoscope in the sign of Leo and the presence of benefic Saturn in the fifth house of this horoscope in the sign of Aquarius can supply much more positive energy to benefic debilitated Sun and all other benefic planets mentioned in this example. The native in this case may engage in the field of information and technology or he may engage in the field of some type of engineering, he may get blessed with a very well paying job in a foreign country, related to one of these fields and he may settle in such foreign country permanently on the basis of his marriage. The combined effect of such benefic debilitated Sun and all other benefic planets can also bless the native with a good married life and the native may enjoy good results in many other spheres of his life also. Apart from marriage, benefic debilitated Sun in the first house of a horoscope can also bless the native with success in a number of professional fields due to which the natives under its effect may engage in many professional fields and they may achieve success through them, as allowed by their overall horoscopes. On the other hand, malefic debilitated Sun in the first house of a horoscope can trouble the native with problems related to marriage, profession, finances, health and many other types of problems. Accordingly the natives under the effect of this malefic influence may have to suffer from some of these problems depending on the overall tone of their horoscopes. Such malefic debilitated Sun can especially prove bad for the professional and financial aspect of the native and accordingly the native may feel the maximum heat of this placement in these spheres of his life. This is due to the reason that when debilitated Sun is placed in the first house of a horoscope in the sign of Libra, the sign Leo ruled by Sun falls in the eleventh house of that horoscope. Since eleventh house of a horoscope primarily deals with the professional and income aspect of the native, any type of weakness to the lord of this house may results in problems in these spheres of a native’s life. Hence the placement of malefic debilitated Sun in the first house of a horoscope in the sign of Libra can trouble the native with problems in these spheres of his life. At the same time, if either such malefic debilitated Sun is joined by a strong benefic planet in the first house or a strong benefic planet is placed in the eleventh house of this horoscope, the problems may reduce. This is because, the presence of a strong benefic planet along with malefic debilitated Sun may provide extra strength to the Sun; and the presence of a strong benefic planet in the eleventh house of a horoscope can provide extra strength to the eleventh house. In both these cases, the eleventh house of this horoscope may gain extra strength and the problems related to professional and financial aspect of the native may reduce or they may not be caused at all. On the other hand, if either such malefic debilitated Sun or the eleventh house of such horoscope is afflicted by malefic planets, the problems may intensify. Accordingly the native under the combined effect of such malefic influences may have to suffer from serious problems in the field of his profession as well as in the field of his finances. Such native may have to work for low paying or very low paying jobs and he may also have to live in poverty for many years of his life or for his entire life, if there are no strong benefic planets in his horoscope, which indicate good financial results. When positive in nature, debilitated Sun placed in the second house of a horoscope can bless the native with good results related to marriage, profession, finances, health and many other types of good results. Accordingly the natives under the effect of this benefic influence may come across some of these good results depending on the overall tone of their horoscopes. Such benefic debilitated Sun can especially prove good for the professional sphere of the native due to which the natives under its impact may engage in a number of professional fields and they may achieve success through them, as allowed by their overall horoscopes. The presence of such benefic influence in a horoscope can also bless the native with a post of power and authority in the house of government through some job or through politics depending on the overall tone of his horoscope. For example, if benefic debilitated Sun is placed in the second house of a horoscope in the sign of Libra along with benefic Mercury; benefic debilitated Venus is placed in the first house of this horoscope in the sign of Virgo and benefic Mars is placed in the twelfth house of this horoscope in the sign of Leo, the native may become a revenue officer. The native under the combined effect of these benefic planets may get selected for the post of a revenue officer in government and he may achieve good amount of success and recognition through this field of profession. At the same time, if benefic debilitated Jupiter is placed in the fifth house of this horoscope in the sign of Capricorn along with benefic Saturn; and benefic Moon is placed in the eighth house of this horoscope in the sign of Aries, the equation may become much more positive. The native blessed by such benefic debilitated Sun, debilitated Venus, debilitated Jupiter and all other planets mentioned in this example may appear in some competitive exams for selection in revenue services and by means of success in such exams, he may get selected for the highest possible direct rank in revenue services. The combined effect of such benefic debilitated Sun and all other benefic planets may also bless the native with very good amount of recognition and success through this field of profession. This is due to the fact that the addition of benefic Moon to the eighth house of this horoscope in the sign of Aries may add much more positive energy to this horoscope and the addition of a benefic combination of debilitated Jupiter and Saturn to the fifth house of this horoscope may form Neechbhang Rajyoga in the horoscope. According to its definition, if a benefic debilitated planet is joined by a benefic planet which is either the lord of its sign of debilitation or which gets exalted in its sign of debilitation, the debilitation status of such planet may get cancelled and Neechbhang Rajyoga may be formed in the horoscope, which may bless the native with very good results in some sphere of his life. In the present case, benefic debilitated Jupiter is present in the fifth house of this horoscope in the sign of Capricorn along with benefic Saturn which is the lord of the sign Capricorn. Hence such benefic Saturn may cancel the debilitation status of Jupiter and together these two planets may form Neechbhang Rajyoga in this horoscope. Since the overall tone of the horoscope is supportive for making this native a revenue or taxation officer in government, the native under the combined effect of such benefic debilitated Sun, debilitated Venus, debilitated Jupiter and all other benefic planets may get selected for the highest possible direct rank in revenue services. The native may also come across very good amount of success and recognition through this field of profession and he may achieve even better results if at the same time, benefic Rahu is present in the first house of this horoscope in the sign of Virgo along with benefic debilitated Venus. The native in this case may achieve even better results under the combined effect of such benefic debilitated Sun and all other benefic planets and he may get blessed with a very good career as a revenue officer, where such career may be filled with prestigious postings and accomplishments. This is a very good horoscope to learn from as there are three debilitated planets in this horoscope but even then the native is capable of getting very good results related to his professional sphere. This is due to the fact that debilitated Sun, debilitated Venus and debilitated Jupiter placed in various houses of this horoscope are all supported by other benefic planets in the same houses. Hence such debilitated Sun and other debilitated planets gain extra strength, they come out of their state of being very weak and they are able to bless the native with significant results. Benefic Mercury placed in the second house of this horoscope in the sign of Libra may provide extra strength to debilitated Sun placed in the same house, benefic Saturn placed in the fifth house of this horoscope in the sign of Capricorn may provide much extra strength to debilitated Jupiter in the same house and benefic Rahu placed in the first house of this horoscope in the sign of Virgo may provide extra strength to debilitated Venus in the same house. Hence all these debilitated planets may come out of their state of weakness and they may bless the native with very good results, like the results mentioned in this example. It should once again be understood that the state of debilitation of a planet means its state of extreme physical weakness and it doesn’t mean that its working nature is malefic in a horoscope, merely due to its placement in its sign of debilitation. Hence if such debilitated planets like debilitated Sun, debilitated Venus and debilitated Jupiter in this example gain extra strength through some other positive planets, they may bless the native with very good results. 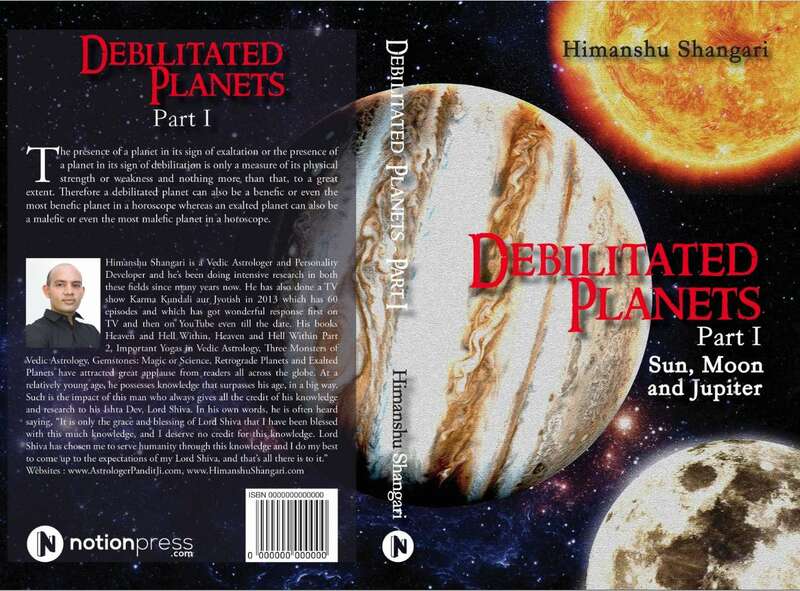 The reason for such debilitated planets being able to provide very good results to the native is not the only due to the fact that such benefic debilitated planets come out of their state of debilitation, but it is also due to the fact that when a benefic debilitated planet gains extra strength due to presence of another strong benefic planet with it, a combination of two benefic planets is formed in such horoscope. As a combination of two benefic planets is always better than a benefic planet placed alone in some house of a horoscope, hence the results may become very good. This is why such debilitated Sun and other debilitated planets mentioned in this example may bless the native with very good results once they gain extra strength due to their presence with other positive planets. Benefic debilitated Sun in the second house can bless the native with a post of power and authority through many other professions and it can also bless the native with success in many other fields of profession, depending on the overall tone of the horoscope of a native in question. On the other hand, malefic debilitated Sun in the second house of a horoscope can trouble the native with problems related to marriage, profession, finances, health and many other types of problems. Accordingly the natives under the effect of this malefic influence may come across some of these problems depending on the overall tone of their horoscopes. Such malefic debilitated Sun may especially prove bad for the professional and financial sphere of the native due to which the natives under its effect may face more problems in these spheres of their lives. Some of these natives may not be able to establish professionally till late in their lives and they may also have to struggle a lot in order to see satisfactory results in their respective professions. Some other natives under the effect such malefic debilitated Sun may have to work for low paying jobs and they may also have to face many types of financial problems in their lives, primarily due to their low incomes. In extreme cases when supported by other malefic influences in a horoscope, malefic debilitated Sun in the second house can trouble the native with a life of poverty, as such native may only find low or very low paying jobs to engage in. Some other natives under the effect of such malefic debilitated Sun may have to suffer from problems in their marriages as they may not have proper compatibility with their wives. Such natives may suffer from frequent arguments with their wives primarily due to differences of opinion with their wives on most issues. Such problems may become serious if this malefic influence is supported by some other malefic influences in a horoscope and the native may even have to suffer from a broken marriage. In extreme cases when supported by other malefic influences, malefic debilitated Sun in the second house of a horoscope can break more than one marriage of the native under its impact. According to Vedic astrology, Venus is debilitated in a horoscope when it is placed in the sign of Virgo, which in simple words means that Venus becomes the weakest when placed in Virgo compared to its placement in all the other signs. Debilitated Venus is associated with many bad things by many astrologers and it is believed by a number of astrologers that debilitated Venus always works negatively in a horoscope and it brings bad results for the native under its influence. This is not the case in actual practice and debilitated Venus can work positively as well as negatively in a horoscope depending on the other deciding factors and depending on the overall tone of the horoscope of a native under consideration. The word debilitated simply relates to the strength of Venus in a horoscope and it doesn’t relate to the nature of Venus in a horoscope. Accordingly debilitated Venus placed in different houses of a horoscope can give benefic as well as malefic results depending on the nature of Venus as well as depending on the overall tone of the horoscope. We will now discuss some of these benefic as well as malefic effects which can be experienced when debilitated Venus is placed in different houses of a horoscope. While discussing some of these effects, it should be noted that due to its debilitation, Venus alone generally doesn’t provide strong positive or negative results and it needs to be supported by other positive or negative planets in order to produce such results. Hence we will discuss good or bad results given by debilitated Venus in combination with other positive or negative planets in a horoscope. Debilitated Venus in 1st House : When benefic in nature, debilitated Venus placed in the first house of a horoscope can bless the native under its influence with good results related to marriage, profession, finances, health and many other type of good results. Accordingly the natives under the effect of this benefic influence may come across some of these good results depending on the overall tone of their horoscopes. Such benefic debilitated Venus can bless the natives under its influence with many types of good results through their marriages due to which these natives may come across these good results of different type and different quantum, depending on the overall tone of their horoscopes. Some of these natives may get married to people belonging to foreign countries and they may settle abroad on the basis of their marriages. For example, if benefic debilitated Venus is placed in the first house of a horoscope in the sign of Virgo, benefic Jupiter is placed in the ninth house of this horoscope in the sign of Taurus and a benefic combination of Sun and Mercury is placed in the twelfth house of this horoscope in the sign of Leo, the native may get married to a foreign citizen. The native blessed by such benefic debilitated Venus and other benefic planets may get married to a woman belonging to a foreign country and he may settle in such foreign country on the basis of his marriage, if there are no opposing influences in his horoscope. For example, if Ketu is placed in the twelfth house of this horoscope in the sign of Leo along with benefic Sun and Mercury when benefic debilitated Venus and all other benefic planets are placed in the already mentioned houses of this horoscope, the native may not settle abroad. The native under the combined effect of all these benefic planets may get married to a foreigner but he may not permanently settle in a foreign country though he may stay there for periods of few months, many times in his life. However if instead of being placed in the twelfth house of this horoscope in the sign of Leo, benefic Ketu is placed in the eleventh house of this horoscope in the sign of Cancer along with benefic Saturn; and benefic Rahu is placed in the fifth house of this horoscope in the sign of Capricorn, the native may settle abroad. The native blessed by such benefic debilitated Venus and other benefic planets may settle abroad on the basis of his marriage and he may enjoy a good marriage. The combined effect of these benefic planets may also bless the native with good amount of professional success as well financial prosperity in such foreign country. The native blessed by such benefic debilitated Venus and other benefic planets may engage in some type of creative designing, he may work for a social media company or he may become an IT professional, depending on the rest of his horoscope. As more benefic influences add to this horoscope, the native under the combined effect of such benefic debilitated Venus and other benefic planets may achieve even better results. For example, the presence of benefic Moon in the seventh house of this horoscope in the sign of Pisces may bless the native with even more success in his profession as well as with an even better marriage. Since Venus is the planet of beauty and creativity, benefic debilitated Venus in the first house of a horoscope can bless some natives with creative abilities and these natives may achieve success through the fields of profession where such creative abilities are valued. For example, if benefic debilitated Venus is placed in the first house of a horoscope in the sign of Virgo, benefic Mercury is placed in the second house of this horoscope in the sign of Libra, benefic Sun is placed in the third house of this horoscope in the sign of Scorpio and benefic Moon is placed in the eleventh house of this horoscope in the sign of Cancer, the native may become a singer. The native blessed by such benefic debilitated Venus and other benefic planets may have very good singing talent and he may engage in this field on professional basis after receiving much appreciation for his singing abilities during his young age. The combined effect of such benefic debilitated Venus and other benefic planets can bless the native with good amount of success, money and fame through the field of singing; and the native may benefit even more if there are some other benefic influences in his horoscope. At the same time, if benefic exalted Saturn is placed in the second house of this horoscope in the sign of Libra along with benefic Mercury, benefic Rahu is placed in the ninth house of this horoscope in the sign of Taurus and benefic Ketu is placed in the third house of this horoscope in the sign of Scorpio along with benefic Sun, the equation may become much more productive. The native blessed by such benefic debilitated Venus and other benefic planets may achieve much more success as a singer and he may earn very good amount of money, fame and recognition through this field of profession. The native under the combined effect of such benefic debilitated Venus and other benefic planets may particularly receive much appreciation and fame through some love songs sung by him and he may even receive some formal awards for some of these songs. As more benefic influences add to this horoscope, the native blessed by such benefic debilitated Venus and other benefic planets may achieve even better results through the field of singing. For instance, the presence of benefic Jupiter in the twelfth house of this horoscope in the sign of Leo can enhance this equation and the native may achieve fame on international level, through the field of singing. Apart from this, benefic debilitated Venus in the first house of a horoscope can bless the native with success through many other fields of profession and it can also bless the native with many other types of good results through many other spheres of his life, depending on his overall horoscope. On the other hand, malefic debilitated Venus in the first house of a horoscope can trouble the native with problems related to marriage, profession, finances, health and many other types of problems. Accordingly the natives under its impact may have to suffer from some of these problems depending on the overall tone of their horoscopes. Such malefic debilitated Venus can trouble the natives under its effect with many types of problems related to their marriages due to which some of these natives may not get married on time and their marriages may get delayed on account of one reason or the other. Malefic debilitated Venus in the first house of a horoscope can also cause upsets in the love life of the native due to which some natives under its influence may have to suffer from the loss of long lasting love relationships. These natives may invest many years of their lives in some meaningful love relationships but they may not convert into marriages due to various reasons depending on the overall tone of their horoscopes. For example, if malefic debilitated Venus is placed in the first house of a horoscope in the sign of Virgo, malefic Rahu is placed in the fifth house of this horoscope in the sign of Capricorn and malefic Ketu is placed in the eleventh house of this horoscope in the sign of Cancer, the native may face problems in his love relationship. Such native may pursue a love relationship with a girl and such relationship may go well during the first couple of years, but over the course of time, differences may start surfacing between the native and his lover and they may spoil this relationship. At the same time, if malefic Saturn is placed in the twelfth house of this horoscope in the sign of Leo and malefic Mars is placed in the ninth house of this horoscope in the sign of Taurus when malefic debilitated Venus and other malefic planets are placed in the already mentioned houses of this horoscope, the equation may become much more negative. The native troubled by such malefic debilitated Venus and other malefic planets may have to face serious problems in his love relationship and this relationship may finally break due to such problems. Such a relationship may continue for many years but it may not convert into a marriage and it may cause much pain to the native. Malefic debilitated Venus in the first house can also trouble the native with problems in his marriage and if it is supported by other malefic influences in a horoscope, it can break one marriage of the native due to many types of problems depending on the overall tone of the horoscope of the native. In extreme cases when supported by other marriage breaking influences, malefic debilitated Venus in the first house of a horoscope can break more than one marriage of the native after making him experience very bad things through such marriages. When working positively, debilitated Venus placed in the second house of a horoscope can bless the native with good results related to marriage, profession, finances, health and many other types of good results. Accordingly the natives under the effect of this benefic influence may come across some of these benefic results depending on the overall tone of their horoscopes. Such benefic debilitated Venus can especially prove good for the professional sphere of the native as it can bless him with success through many fields of profession. Hence these natives may engage in a variety of professional spheres and they may achieve the amount of success through them, as allowed by their overall horoscopes. Some of these natives may engage in the fields of profession related to the line of finance and they may achieve success through them. For example, if benefic debilitated Venus is placed in the second house of a horoscope in the sign of Virgo, benefic Mercury is placed in the first house of this horoscope in the sign of Leo along with benefic Sun; and benefic Saturn is placed in the tenth house of this horoscope in the sign of Taurus, the native may engage in the line of banking. The native blessed by such benefic debilitated Venus and other benefic planets may get a well paying job in a bank and he may earn good amount of money, success and recognition through this field of profession. At the same time, if benefic Mars is placed in the eighth house of this horoscope in the sign of Pisces and benefic Moon is placed in the sixth house of this horoscope in the sign of Capricorn when benefic debilitated Venus and other benefic planets are placed in the already mentioned houses of this horoscope, the equation may become much more productive. The native blessed by such benefic debilitated Venus and other benefic planets may get blessed with a post of authority in a well established bank and he may earn very good amount of money, success and recognition through the field of banking. 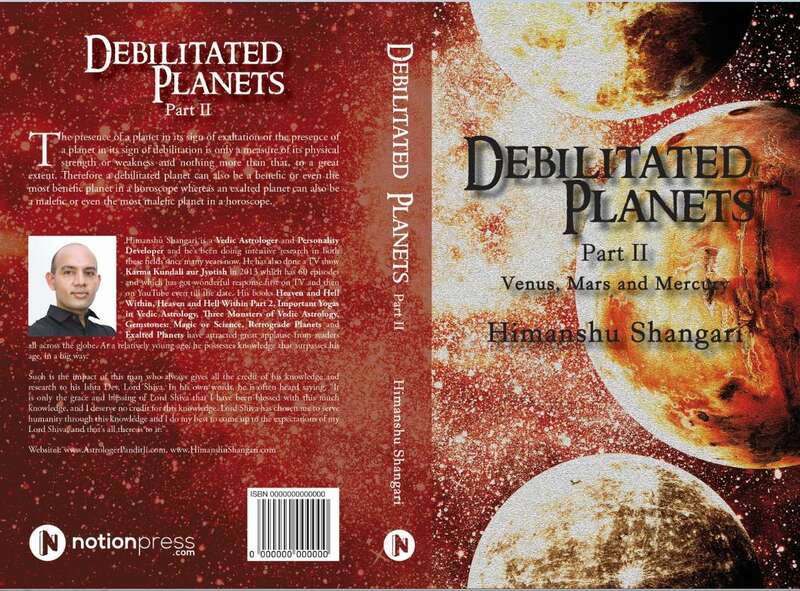 The combined effect of such benefic debilitated Venus and other benefic planets may especially bless the native with very good results through his profession after his age of 35 and the native may get blessed with many posts of authority after this age, till the time of his retirement. As more benefic influences add to this horoscope, the native under the combined effect of such benefic planets may achieve even more success through this field of profession. Benefic debilitated Venus in the second house of a horoscope can also bless the native with a post of authority in the house of government through some job related to the line of finance and accordingly some natives may come across this result. For example, if benefic debilitated Venus is placed in the second house of a horoscope in the sign of Virgo and a benefic combination of Sun and Jupiter is placed in the first house of this horoscope in the sign of Leo, the native may become a revenue officer. The native blessed by such benefic debilitated Venus and other benefic planets may get blessed with a post of authority in revenue services and he may achieve good amount of success and recognition through this field of profession. At the same time, if benefic exalted Mercury is placed in the second house of this horoscope in the sign of Virgo along with benefic debilitated Venus; and benefic Mars is placed in the fifth house of this horoscope in the sign of Sagittarius, the equation may become much better. The native blessed by such benefic debilitated Venus and other benefic planets may appear in some competitive exams for selection in revenue services and by means of success in such exams, he may get selected for the highest possible direct rank in revenue services. This is due to the fact that the combination of benefic debilitated Venus and benefic exalted Mercury in the second house of this horoscope may form Neechbhang Rajyoga in the horoscope. According to its definition, if a benefic debilitated planet is joined by a benefic planet which is either the lord of its sign of debilitation or which gets exalted in its sign of debilitation, the debilitation status of this planet may get cancelled and Neechbhang Rajyoga may be formed in the horoscope, which may bless the native with very good results in some spheres of his life. In the present case, benefic exalted Mercury being the lord of the sign Virgo as well as being exalted in the sign of Virgo may cancel the debilitation status of Venus and these two benefic planets may form Neechbhang Rajyoga in the second house of this horoscope. This yoga may bless the native with a post of authority in the house of government, in a department related to finance, when supported by the overall horoscope. Hence the native under the combined effect of such benefic debilitated Venus and other benefic planets may get selected for a post of high authority in revenue services and he may earn very good amount of success and recognition through this field of profession. As more benefic influences add to this horoscope, the native blessed by such benefic debilitated Venus and other benefic planets may achieve even more success as a revenue officer. For example, the presence of benefic Rahu in the sixth house of this horoscope in the sign of Capricorn along with benefic Moon and the presence of benefic Ketu in the twelfth house of this horoscope in the sign of Cancer may bless the native with even more success through this field of profession. The native under the combined effect of such benefic debilitated Venus and other benefic planets may get blessed with many prestigious postings as well as deputations during his career and he may work at very high levels in his department, before his retirement. Considering one more example from the field of finance, if benefic debilitated Venus is placed in the second house of a horoscope in the sign of Virgo and a benefic combination of Sun, Mercury and Saturn is placed in the first house of this horoscope in the sign of Leo, the native may engage in a loan providing institution. The native under the combined effect of such benefic debilitated Venus and other benefic planets may get a well paying job in a financial institution which provides home loans, vehicles loans, corporate loans and other such types of loans and he may earn good amount of money and success through this field of profession. At the same time, if benefic exalted Mars is placed in the sixth house of this horoscope in the sign of Capricorn and benefic Jupiter is placed in the eleventh house of this horoscope in the sign of Gemini when benefic debilitated Venus and other benefic planets are placed in the already mentioned houses of this horoscope, the equation may become much better. The native blessed by such benefic debilitated Venus and other benefic planets may get blessed with a post of authority in a loan providing institution and he may earn very good amount of money, success and recognition through this field of profession. The combined effect of such benefic debilitated Venus and other benefic planets may bend the native more towards the section of corporate loans. It means that this native may be given charge of the loaning section which provides loans to corporate houses and the native may perform very well in this section. As more benefic influences add to this horoscope, the native blessed by such benefic debilitated Venus and other benefic planets may achieve even better results through this field of profession. For instance, the presence of benefic Rahu in the sixth house of this horoscope in the sign of Scorpio along with benefic exalted Mars and the presence of benefic Ketu in the twelfth house of this horoscope in the sign of Cancer can render even more success to the native, through this field of profession. On the other hand, malefic debilitated Venus in the second house of a horoscope can trouble the native with problems related to marriage, profession, finances, health and many other types of problems. Accordingly the natives under the effect of this malefic influence may have to suffer from some of these problems depending on the overall tone of their horoscopes. Some natives under the effect of such malefic debilitated Venus may feel the heat of this placement in the field of their marriages due to which some of these natives may not get married on time and their marriages may get delayed on account of one reason or the other. Some other such natives may have to face many problems in their marriages and such problems may intensify if there are some other malefic influences in the horoscopes of these natives. In extreme cases when supported by other malefic influences, malefic debilitated Venus in the second house of a horoscope can make the native suffer from more than one divorce after troubling him a lot through such marriages. Malefic debilitated Venus in the second house of a horoscope can also trouble the native with problems related to his profession as well as with problems related to his overall financial equation. Some natives under the effect of this malefic influence may have to suffer from financial tightness many times in their lives and if such malefic debilitated Venus is supported by some other malefic planets in a horoscope, the native may have to face serious financial crisis, more than once in his life. In extreme cases when supported by other malefic influences, malefic debilitated Venus in the second house of a horoscope can make the native spend his entire life in poverty and the native may not witness much improvement in his financial equation, despite his best efforts. When working positively, debilitated Jupiter placed in the second house of a horoscope can bless the native with good results related to marriage, profession, finances, health and many other types of good results. Accordingly the natives under the effect of this benefic influence may come across some of these good results depending on the overall tone of their horoscopes. Such benefic debilitated Jupiter can especially prove good for the professional and financial aspect of the native due to which the natives benefitting from it may engage in a number of professional fields and they may achieve the amount of success through them, as allowed by their overall horoscopes. Some of these natives may engage in the line of education and they may achieve success through this field of profession. For example, if benefic debilitated Jupiter is placed in the second house of a horoscope in the sign of Capricorn, benefic Saturn is placed in the fourth house of this horoscope in the sign of Pisces and a benefic combination of Sun and Mercury is placed in the tenth house of this horoscope in the sign of Virgo, the native may become a teacher. The native blessed by such benefic debilitated Jupiter and other benefic planets may complete his study in some formal subject of education and he may become a teacher in such subject after that. The combined effect of these benefic planets can bless the native with a well paying job in a college and the native may earn good amount of money, success and recognition through this field of profession. At the same time, if benefic Rahu is placed in the second house of this horoscope in the sign of Capricorn along with benefic debilitated Jupiter, benefic Ketu is placed in the eighth house of this horoscope in the sign of Cancer and benefic Venus is placed in the ninth house of this horoscope in the sign of Leo, the equation may become much more positive. The native blessed by such benefic debilitated Jupiter and other benefic planets may start his own coaching institute or school and he may earn good amount of success, recognition and money through such institute. The combined effect of such benefic debilitated Jupiter and other benefic planets can also bless the native with good growth in this field of profession and the native may especially witness very good results after his age of 42. At the same time, if benefic exalted Mars is placed in the second house of this horoscope in the sign of Capricorn along with benefic debilitated Jupiter and Rahu, the results may improve a lot. This is because benefic exalted Mars placed in the second house of this horoscope in the sign of Capricorn along with benefic debilitated Jupiter may cancel the debilitation status of Jupiter as Mars gets exalted in the sign of Capricorn. Hence these two planets may form Neechbhang Rajyoga in the horoscope which may bless the native with very good results through the field of education. The native under the combined effect of such benefic debilitated Jupiter and other benefic planets may become the owner of a chain of schools or other educational institutes and he may earn very good amount of money, success and recognition through the field of education. Benefic debilitated Jupiter in the second house of a horoscope can also bless the native with a post of power and authority in government and accordingly some natives may achieve this result through job or through politics depending on the overall tone of their horoscopes. For example, if benefic debilitated Jupiter is placed in the second house of a horoscope in the sign of Capricorn, benefic Saturn is placed in the first house of this horoscope in the sign of Sagittarius along with benefic Moon; and benefic Venus is placed in the eighth house of this horoscope in the sign of Cancer, the native may become a revenue officer. The native under the combined effect of such benefic debilitated Jupiter and other benefic planets may get selected for a post of authority in revenue services and he may enjoy good amount of success and recognition through this field of profession. At the same time, if benefic exalted Mars is placed in the second house of this horoscope in the sign of Capricorn along with benefic debilitated Jupiter and a benefic combination of Sun and Mercury is placed in the ninth house of this horoscope in the sign of Leo, the equation may become much more productive. The native under the combined effect of such benefic debilitated Jupiter and other benefic planets may get selected for the highest possible direct rank in revenue services by means of success in some competitive exams held for selection in revenue services. This is due to the reason that the presence of benefic exalted Mars in the second house of this horoscope along with benefic debilitated Jupiter may cancel the debilitation status of Jupiter and together these two benefic planets may form Neechbhang Rajyoga in the second house of this horoscope. Since the overall tone of this horoscope indicates a post of authority in revenue services, the native under the combined effect of such benefic debilitated Jupiter and other benefic planets may get selected for highest possible direct rank in revenue services and he may achieve very good amount of success, recognition and growth as a revenue officer. The native blessed by such benefic debilitated Jupiter and other benefic planets may witness a very good career as a revenue officer and he may accomplish some very good things during his career. As more benefic influences add to this horoscope, the native under the combined effect of all such benefic influences may achieve even better results through this field of profession. Apart from this, benefic debilitated Jupiter in the second house of a horoscope can bless the native with success through many other fields of profession and this benefic influence can also render good results to the native, through the field of marriage. On the other hand, malefic debilitated Jupiter in the second house of a horoscope can trouble the native with problems related to marriage, profession, finances, health, lifespan and many other types of problems. Accordingly the natives under its effect may have to suffer from some of these problems depending on the overall tone of their horoscopes. Such malefic debilitated Jupiter can prove bad for the health and lifespan of the native and it can trouble the native with many types of health problems and diseases. This is because when malefic debilitated Jupiter is placed in the second house of a horoscope in the sign of Capricorn, the sign Sagittarius ruled by Jupiter falls in the first house of that horoscope. Hence Sagittarius becomes the ascendant for such horoscope and Jupiter being the planetary lord of Sagittarius becomes the lord of ascendant for such horoscope. The placement of malefic Jupiter being the lord of ascendant in its sign of debilitation can weaken the entire horoscope and as a result, the native may get prone to suffering from health problems and diseases. Such problems may intensify if malefic debilitated Jupiter in the second house of a horoscope is supported by some other malefic influences. For example, if malefic debilitated Jupiter is placed in the second house of a horoscope in the sign of Capricorn, a malefic combination of Moon and Saturn is placed in the fourth house of this horoscope in the sign of Pisces and malefic Mars is placed in the eleventh house of this horoscope in the sign of Libra, the native may suffer from a serious disease. The native under the effect of such malefic debilitated Jupiter and other malefic planets may get afflicted by some serious disease and he may have to suffer from much pain due to such disease. At the same time, if malefic debilitated Venus is placed in the tenth house of this horoscope in the sign of Virgo and a malefic combination of Sun and Rahu is placed in the ninth house of this horoscope in the sign of Leo when malefic Ketu is placed in the third house in the sign of Aquarius, the equation may become much more negative. The native under the combined effect of such malefic debilitated Jupiter and other malefic planets may suffer from a life threatening disease and he may have to undergo long treatment as well as multiple surgeries towards the treatment of such disease. The combined effect of such malefic debilitated Jupiter and other malefic planets may afflict the native with some type of cancer and the native may have to suffer a lot due to such cancerous disease. If malefic Mercury is placed in the eighth house of this horoscope in the sign of Cancer when malefic debilitated Jupiter and other malefic planets are placed in the already mentioned houses of this horoscope, the results may become disastrous. The native suffering from all these malefic planets may die at a young age by virtue of such cancerous disease, after suffering a lot through such disease. Apart from this, malefic debilitated Jupiter in the second house of a horoscope can also create problems in the profession of the native due to which some natives under its influence may not find suitable jobs till late in their lives. Some other natives under its effect may have to engage in low paying jobs despite being qualified for well paying jobs, due to various reasons depending on the overall tone of their horoscopes. Yet some other natives under the influence of such malefic debilitated Jupiter may have to suffer from financial losses and setbacks through their professions and these losses may become serious if there are some other malefic influences in the horoscope of such a native. In extreme cases when supported by other malefic planets, malefic debilitated Jupiter in the second house of a horoscope can make the native suffer from very big financial losses through his profession, more than once in his life.